Before we joined, we did a lot of research on the Peace Corps. 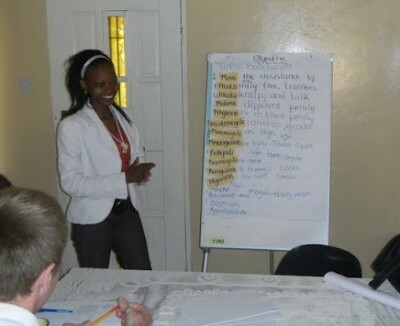 One of the things we learned was that the Peace Corps has one of the finest language training programs around. Over the last 50 years, the Peace Corps has trained over 250,000 volunteers. They know what they are doing. Learning any language is difficult for me. When I thought about joining the Peace Corps that was one of the things I stressed about the most. In high school I studied Latin which is not a spoken language. I struggled with Latin, but when I tried to learn Spanish I really had trouble. I could learn the words, read them and write them, but understanding them when spoken was an entirely different matter. 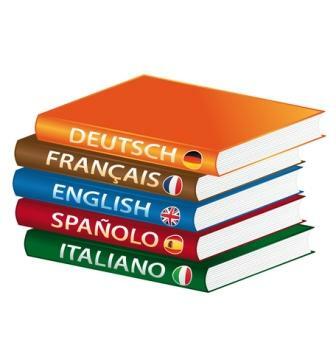 Learning the language worried me, but I did like the idea of knowing a second language. I hoped that we would learn a language that we could use for the rest of our lives. There was a chance we would be sent to South America or Western Africa — where Spanish and French are spoken. We could use those languages, especially Spanish, back in the USA. Then we found out we were going to Botswana where the language to learn is Setswana — unfortunately, no one speaks Setswana outside of Botswana except for a handful of people in neighboring countries. At least I thought it would be fun to be able to talk to Tish in another language from time to time, it could be our “secret” language. We received our official invitation to serve in Botswana in October 2010, but we weren’t to leave until April 2011, giving us a few months to prepare. I tried to be proactive and downloaded the Setswana audio and text files available to us. I could see right away that it would be a challenge. Plus, now that I am older I am realizing that there is some truth to the “Old dog…new tricks” saying. 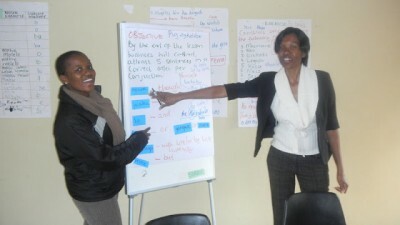 Then the big day came and we went to Botswana and began Pre-Service Training (PST), and language training began in earnest. In the Peace Corps language training is rigorous and intense. Every day during PST we met and broke up into groups of no more than six trainees. They tried to group students who were at the same level. We would meet for several hours in each session and were taught by one or two Language and Culture Facilitators (LCF). Our first LCF was Tiro, and later we were taught by Sebbie and Lily. The rotation of teachers is so the students become accustomed to different voices, accents and mannerisms. Another very important component of culture and language training is the home stay. We stayed with a Botswana family and ideally at home in the evenings we would speak and practice what we had learned during PST, and pick up new things there. We had a challenge at home in that we did not stay with a large family, but just with one older woman, Tebogo, who hardly ever spoke Setswana. In the morning we would say, “Dumela, Tebogo”, only to have her respond with, “Good morning”! There were even long periods when she was gone to the cattle post to be with her husband. We had the run of the place, which was nice, but we didn’t learn any Setswana there. Other volunteers envied our easy home stay, as many were in crowded homes with kids running around, but they learned the most Setswana. Setswana is a really hard language too. Someone once said that in English there often are several words for one meaning while in Setswana there often are several meanings for one word. This is so true. No only do you have different meanings for the same word, the same word can mean something else entirely if it is said with a slightly different tone. The grammer is complicated. There are over 10 different classes of nouns. You have to know which class a noun falls into, and depending on the class there is a different way to make it plural, a different subject marker and a different possessive marker. The goal at the end of PST is to be Novice-High. I scored Novice-High and Tish scored Intermediate-Low. So far so good! Language training and testing continues throughout the years of a Volunteer’s service with proficiency interviews given during In Service raining (IST), Mid-Service Training (MST), and at Close of Service (COS). The Peace Corps hopes you are in the Advanced categories by the end of your service. 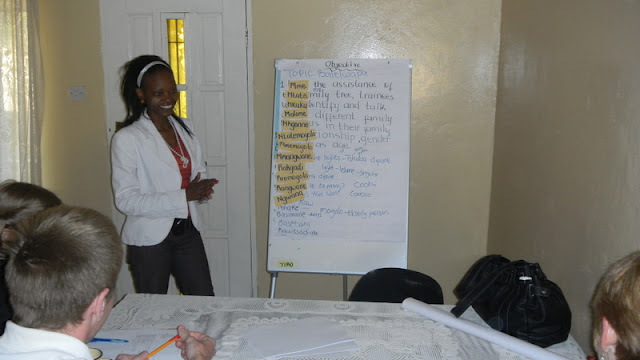 The Peace Corps encourages further language training so this progression will occur. After a volunteer goes to his site, the Peace Corps will reimburse the volunteer for the cost of hiring a Setswana tutor in their village. We never hired a tutor, partly because for the first few months our housing issue was distracting us, but mainly because we weren’t very motivated. Another thing the Peace Corps does to encourage language training is to allow a “language week”. A language week is a week of intensive language training for five or six volunteers who come together at someone’s village and is hosted by a volunteer. The language week is taught by an LCF paid for by the Peace Corps. Because the language week is also an opportunity to travel somewhere without using up leave days, not surprisingly it is usually held in the home of someone in an interesting part of the country. We had a language week in Shakawe which is on the opposite side of the country, right on the Okavanga Delta. It was hosted by Dinah, a volunteer in our group and Pako was our LCF. We did it the week of Thanksgiving and we had a great time but I confess I didn’t learn that much Setswana (my fault). In some countries it is essential that you learn the language or you will not succeed. This would be the case in countries where few people speak English. In countries like that, the Peace Corps will not even send you on to your site if you have not acquired the minimum language skills needed. Botswana is not like that. In fact, the official national language of Botswana is English. The government of Botswana recognized that to be successful and engage with the rest of the world, English must be spoken. Kids are taught English from the first day of school. After their equivalent of the fourth grade, Setswana is forbidden in the school classroom, all teaching from that level on is done completely in English. The result of all of this is that almost everyone speaks passable English. Setswana is still their first language, the one they learned as an infant — but they know English. In my office everyone speaks very good English. I find that I am not called upon to speak Setswana (except for greetings and a words here or there), so there is no pressure to learn. Tish’s situation is similar. 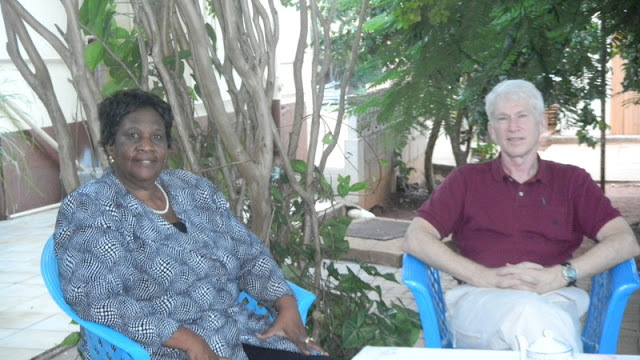 Two of the directors of Stepping Stones International (SSI) are from the USA and Canada. All of the other employees speak English well; and the children at SSI should be speaking English whenever they can, because their success at school depends on it. Because English is so commonly spoken here, no matter how badly you do in language training, the Peace Corps will still send you to site. Peace Corps doesn’t advertise that fact, because they still want you to learn the language, as they should. The truth though is that you don’t have to learn Setswana to serve successfully here in Botswana. This was a relief to me. So the Peace Corps has a great immersion language training program in place, with instruction during PST, home stay, tutors, language week, and a lot of encouragement. Despite all of this we aren’t making any progress. Our problem is motivation. We don’t have to learn the language to be successful here, and so aren’t as motivated. At our In-Service Training (IST) which occurred in August, about four months after being in-country, we were given our second LPI. Both Tish and I had declined in proficiency. We will have another test at Mid Service Training (MST), next month, and I expect to test even lower. No one achieves real fluency after two years in the Peace Corps; even for the superstars, it would take even longer than that. In our group, a few people have become very proficient, moving well into the intermediate categories, and one or two should move into the advanced category during our next testing. These are the young volunteers who have an aptitude for language, who have a keen interest in learning Setswana, and who are in mostly small villages where it is more important to learn the language. Being married works against us. The single volunteers have no one to interact with except for their neighbors and so speaking Setswana naturally improves as they try to integrate. Married volunteers have each other to hang out with and interact less with neighbors. I wish I did know Setswana better, but am just not motivated to do what it takes to learn it. At this point, halfway through my service, I don’t think that is going to change. One reason I wish I did know more is because of how it makes Batswana feel when they hear that you know the language. Their reaction is surprise, and approval. We still remember a few things and speak Setswana from time to time. A few weeks ago we had been shopping in the village. We passed a stand that sold watermelons. Tish wanted one so she walked up to the stand and said, “Dumella mma, Ke kopa legapu” (Hello ma’am, I am asking for a watermelon). The reaction from the lady was priceless. 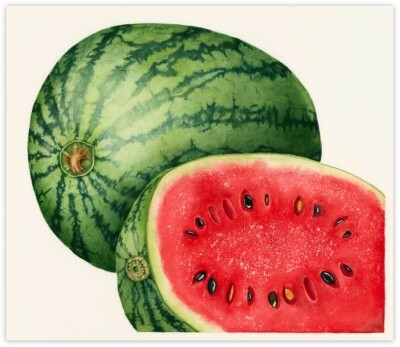 First there was laughter and a big smile, then she said gave us the watermelon at no charge because we spoke Setswana. Moments like that won’t be forgotten. This entry was posted in Peace Corps, Service - Year 2 and tagged Botswana, education, Mobley, Peace Corps. Bookmark the permalink. Another master piece. Most enjoyable! We have a few Setswana speaking people working for us. And we would really like to learn their language to understand and communicate better. Could you please recommend a website or shop where we can find a program to learn Setswana?